In his current series, “Re-located”, Jay Wolke uses a handheld mobile scanner to create abstract images of locations across the globe, challenging the perception of space and perspective with his depictions of place. Similar to a long exposure photograph, Wolke surveys the environment throughout forty second scans, capturing various elements of the location in the process. The lens of the scanner, usually intended to scan documents for enlargement, acts as both camera and light source in Wolke’s images. The resulting large prints are captured at a high resolution, but with a consistently shallow depth of field, distorting the photograph’s depiction of scale and space. For Wolke, the method and the product are inextricably linked, with each image representing an environment collapsed through both space and time into a single representation. The locations he decides to depict are similar in their rich visual texture, populated by elements such as signs, graffiti, art, wall carvings, and vibrant colors. The resulting images have a narrative quality and Wolke likens them to both a filmstrip and a musical score, illustrating how combinations of various elements, like a collage, come together to create a singular work. Jay Wolke completed a BFA at Washington University, St. Louis (1976) and an MS in Photography at the Institute of Design, Illinois Institute of Technology in Chicago (1980). 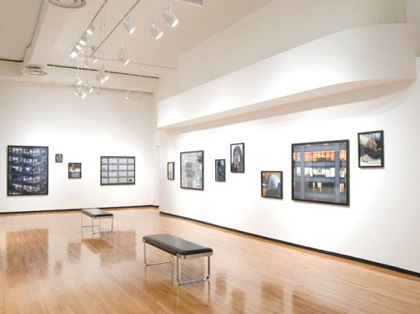 Wolke is a recipient of several grants, including the Illinois Arts Council Grant (1985-1986, 1990-1991, 2005-2006) and the National Endowment/Midwest Arts Alliance Grant (1995-1996). He has exhibited in Italy, Canada, and the United States, and his work is held in many collections, including the Museum of Modern Art, New York; the Art Institute of Chicago; and the Museum of Fine Arts, Boston. Monographs include Along the Divide: Photographs of the Dan Ryan Expressway (2004), All Around the House: Photographs of American-Jewish Communal Life (1998), and Architecture of Resignation: Photographs from the Mezzogiorno (2011). Wolke is on the faculty at Columbia College Chicago.